Like any semi-ancient institution, change does not come easily to the Academy of Motion Picture Arts and Sciences. That’s why bringing out Faye Dunaway and Warren Beatty as Best Picture presenters at the 89th Oscars was so apropos. They were “Bonnie and Clyde”, instigators of the American New Wave, a film that did not win Best Picture in 1968 but still put a charge into the Academy and the industry that allowed for artistically beneficial reverberations. 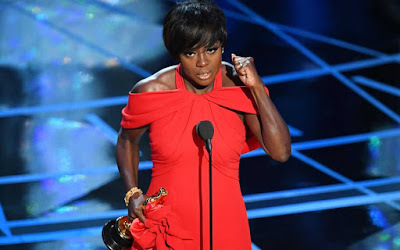 The 2017 Oscars were not as charged as 1968 but nevertheless……a creative oxygen-giving indie like “Moonlight” made for a mere $1.5 million with a gay African-American as its protagonist and rendered in the sort of narrative style subject to “nothing happens” grousing from people who’ve attended one too many Syd Field seminars being one of the two Best Picture front-runners is not an every year occurrence. That is not, to be clear, to take anything away from Cinemascope throwback “La La Land”, the chief competitor of “Moonlight”, which was joyful in its own way, if nonetheless more traditional and more flawed, two notions that Kareem Abdul Jabbar incisively noted in a piece for The Hollywood Reporter. If a Best Picture win for “Moonlight” teased the possibility of the new sign o’ the times, a Best Picture win for “La La Land” teased not so much a signal of regression as a signal of business as usual. It felt like business as usual when Beatty opened the envelope and dawdled, seemingly as an odd means to enhance the drama, and Dunaway announced “La La Land” as Best Picture and the producers and cast and crew ascended the stage and speeches were given…..until a variation of the conclusion to “The Naked Gun 33 1/3” erupted behind the microphone as a guy with a headset appeared and another envelope showed up and onstage faces went slack-jawed and Warren Beatty turned sheepish. What was happening? 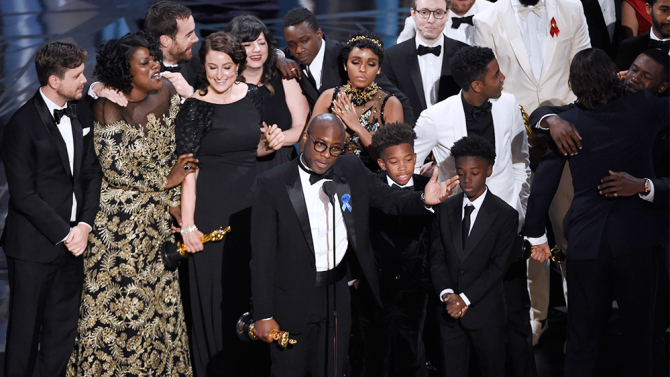 “La La Land” producer Jordan Horowitz, who earned himself a boatload of good karma, pointed at the “Moonlight” crew in their seats and said this: “There’s a mistake. ‘Moonlight,’ you guys won best picture.” Beatty, it turned out, had the wrong envelope, and social media was predictably inundated with enough Dewey Defeats Truman jokes to last until we get a probe to TRAPPIST-1. Up until then, the ceremony had mostly been breezy, non-confrontational, with the most politically charged moment being Iranian Asghar Farhadi, whose “The Salesman” won Best Foreign Film, not attending in protest of President Donald Trump’s travel ban and sending along a statement that read, in part, “Dividing the world into the US and ‘our enemies’ categories creates fear.” It was emblematic that the most charged moment came from someone not there, as if everyone in the room was on his or her best behavior. Jimmy Kimmel’s opening monologue may have taken a few potshots at President Donald Trump but they sounded like your average Tuesday on Jimmy Kimmel Live! Mostly his bit came across designed to build to a victory lap for Meryl Streep, den mother to all these impeccably dressed cubs. Later, Kimmel literally tweeted at Trump which was akin to a radio dee jay pulling harmless pranks. Elsewhere Kimmel escorted a small tourist group across the front of the stage, the bit destined to launch a thousand think pieces, whether about rubes ushered in to get glimpse of the glitterati, most of whom couldn’t even be bothered to stand up (except for a gracious Ryan Gosling – we saw you! ), and then rushed right back out like the non-equals they are, or as a rejoinder to those who feel that regular folks don’t care about cosmopolitan elites, or a mere Man on the Street bit moved indoors that went on too long. Luckily the Best Picture twist ending spared us. The interpretation can be left to the tourists who experienced it, which is perhaps as it should be. The big prizes generally went as planned. Boy wonder Damien Chazelle won Best Director for “La La Land” and Emma Stone won Best Actress for the same, and though I might have preferred Isabelle Huppert, I was impressed by Stone’s graciousness and admittance that she still had learning to do. Mahershala Ali became the first Muslim actor to win an Oscar, deservingly for Best Supporting Actor for “Moonlight”, citing his teachers who told him it’s “not about you” but about the characters. That sort of tied into Viola Davis’s victory speech for Best Supporting Actress for “Fences”, which was the speech of the night, finely calibrated and stirringly delivered, making a beautiful argument for art as a means to “exhume and exalt the ordinary people.” This seemed like a potential vision for the telecast theme, tying it back to the old Ebert observation that movies are like machines for empathy, but instead we received random 80s theme songs as people entered and left the stage as well as nonsense like Kimmel air dropping bags of candies into the laps of stars and the inevitable performances of Best Song nominees that, if scrapped, would have blessedly shaved off so much time. Less empathetic was Casey Affleck winning Best Actor for “Manchester by the Sea.” Make no mistake, his performance is deep, rich and phenomenal; he has also been accused, twice, of sexual assault. And his head-down demeanor during his victory speech, and his confession that he wished he had something more important to say, seemed to convey that he would have been fine simply disappearing. Perhaps there were others that felt the same way. 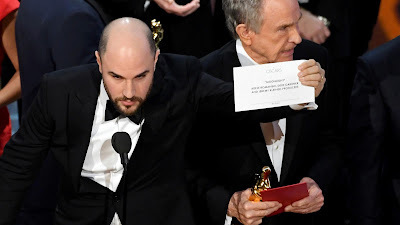 In the end, everything was a footnote to the Best Picture screw-up which was a true shame, for the “La La Land” people, who handled such a wild swing of emotion with incredible grace even if I’m sure they had things to say off the record at the after parties, and for the “Moonlight” team’s moment of deserved triumph being tempered by the WTF? context, and for Faye Dunaway and Warren Beatty who will take heat which upsets me. Bonnie and Clyde should not go out like that. Conspiracy theories were already flying five minutes after the show ended and were officially exhausting five minutes after that, and there was some kind of irony in the pitched “La La Land” v “Moonlight” battle that erupted between Oscar pundits and culture critics for months on end leading up to the show now seemingly destined to descend into a Trump-ish permanent campaign because of this whole farce. But then, maybe this farce was emblematic of something else. Who knows? Time well tell, because you can never really tell anything in the aftermath of these things, whether this was a wonderful one-off or a signal of a shift in Academy interests. But I was left wondering if change is so foreign to the Academy that when it actually comes this is what it looks like - utter confusion.